It only took a month to pre-book a weekend table for two at Viajante! I have to say I was surprised but knowing the following that Nuno Mendes has, I shouldn’t have been. A quite Sunday lunch at 2pm. 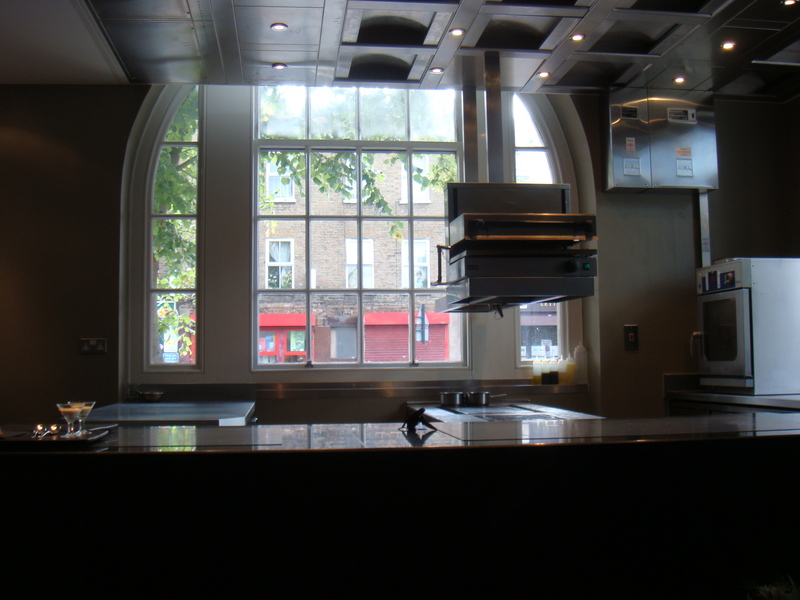 We were greeted to a table directly centre of the open kitchen. Oh, how exciting! Now, where is Nuno?, is he here? is he here? I had been to The Loft Project, but missed eating with Nuno by a week. On enquiring, he tries to have Sunday and Monday off, so once again Nuno Mendes has eluded me! I had convinced my foodie friend, Ms L, that we should have the 6 course tasting menu, as I have heard some have left hungry after the 3 course. 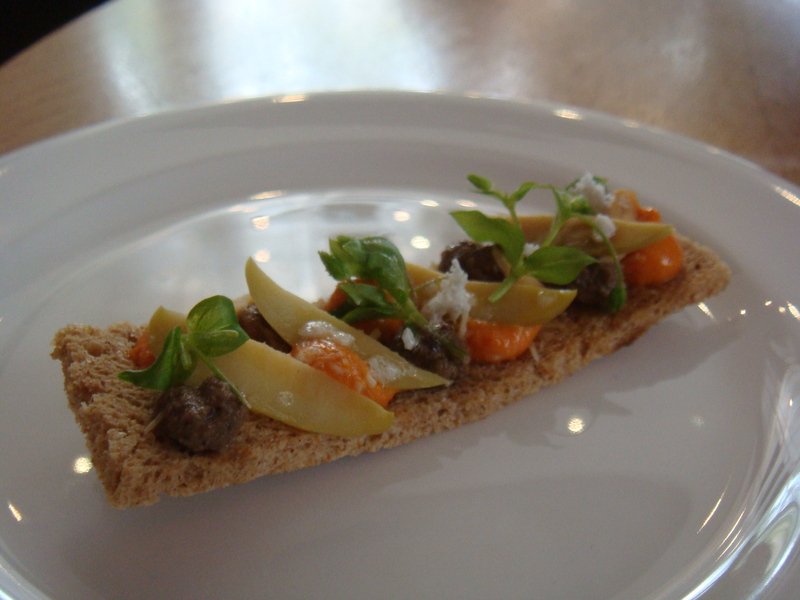 Our first ‘canape’ was the crostini de romesco and gordal olives, almonds and Jerez. I found it lovely and fresh, the crostini, crisp, being a nice welcome to Viajante. 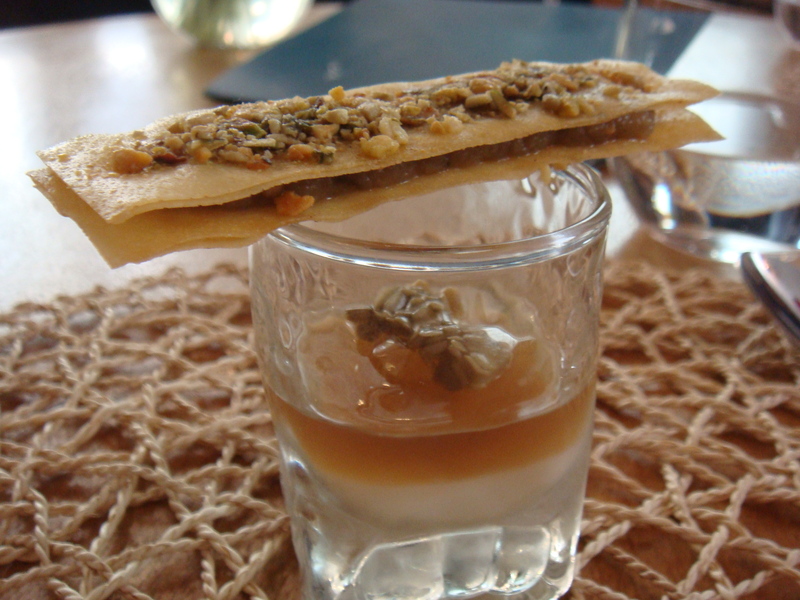 The following ‘canape’ was a Smokey Aubergine with soy milk. The smokey aubergine sandwiched by the crispy light wafer biscuits topped with crushed pistachios was beautifully subtle and delicious. The set dashi and soy milk ‘jelly’ on the other hand was very cold and junket like, not my thing at all, although Ms L did say she liked it. 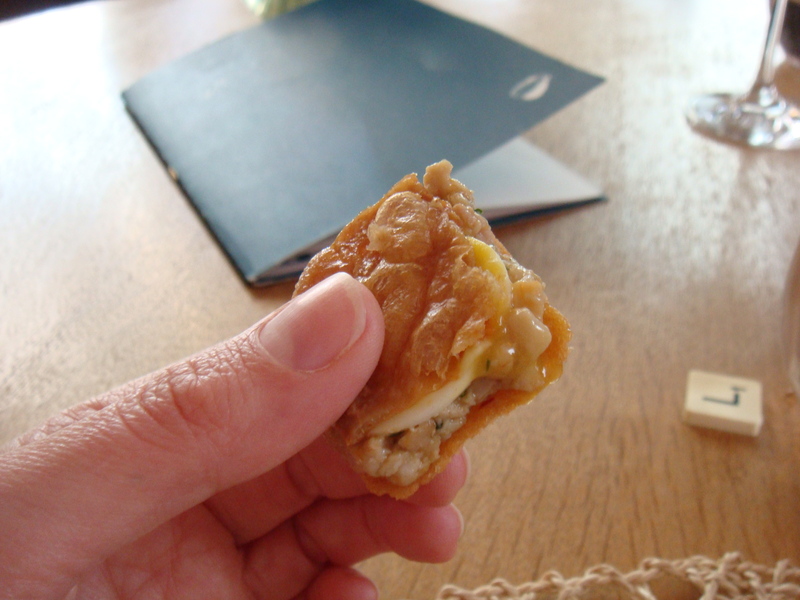 The third ‘canape’ was the Thai explosion 11. Creamy chicken with egg , between crispy wonton-like wafers. As Ms L pointed out , it would have been fine with out the egg. Another lovely subtle bite, although having called it thai explosion, I would have thought it had brought a bit more of a kick to my palate. 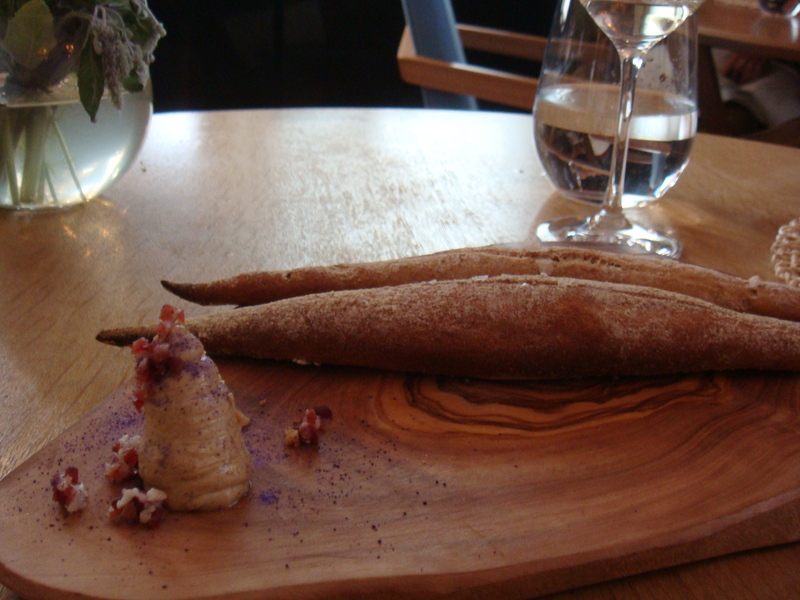 Brought to our table was then a beautiful timber board of house bread, whipped burnt butter with Iberico ham and purple potato powder. The bread was sweet and complemented by the interesting whipped burnt butter (although I still love a big block of good salted butter). 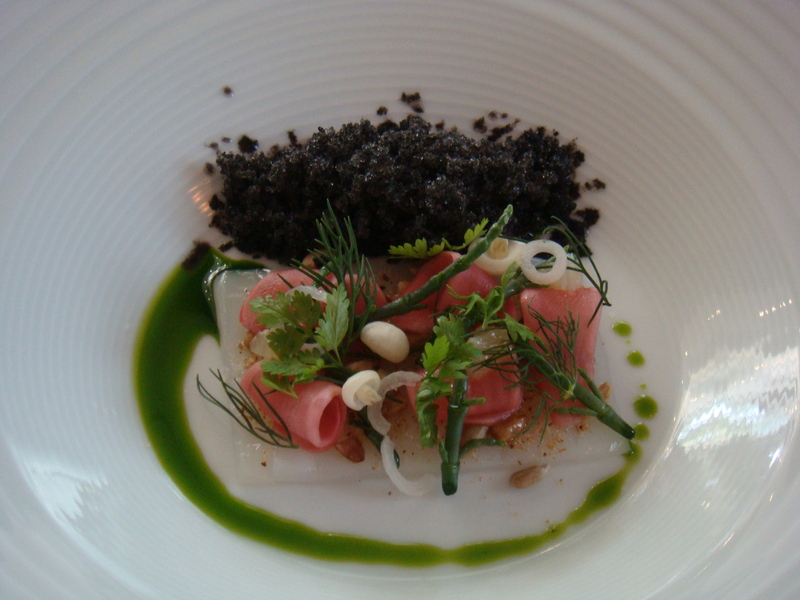 First course, Squid tartare and pickled radishes, samphire and frozen squid ink granita. We had opted for the paired wines, first being a Pewsey Vale 2003, Australia. Our immediate response was how pretty the dish looked! we were told the best way to enjoy the dish was by mixing the herbed puree with the tartare and then taking it with a bit of the granita. The mix worked beautifully until it hit the granita, which I found too cold for my palate. Although I can appreciate and understand the interesting flavours Nuno was trying to communicate. 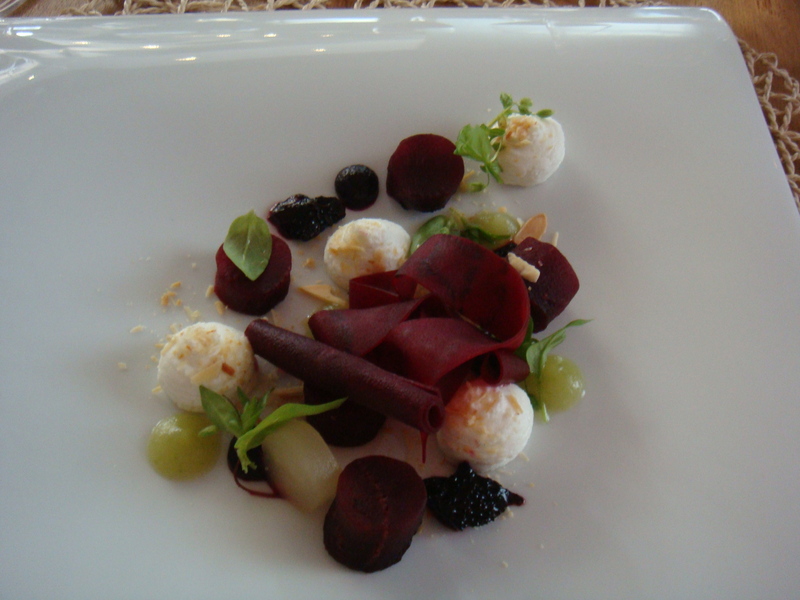 Textures of beetroot, green apple and whipped goats curd, was paired with a Belgium beer, Rodenbach, Gran Cru. OK, so beetroot and goat curd is a restaurant standard. It was a lovely dish with, an interesting pairing . The beer went well with the dish , but was a very dense, sweet, Ale -like beer. Ms L and I agreed we couldn’t have had a whole bottle, esp. as we are wine drinking folk. I can see that Viajante are trying to step outside the ‘comfort zone’ of the more traditional wine pairings. It did get get me thinking about the, possibly, sometimes, boring way in which I pair food and drink. 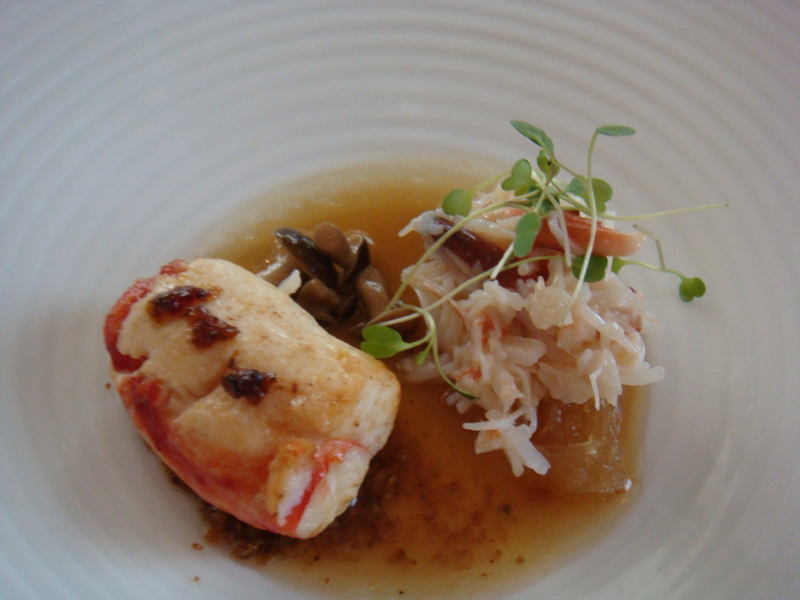 King crab with chicken jus and spicy paste, paired with a Domaine Trapet ‘Beblenheim’ Gewurztraminer 2006, France. Not being a big Gewurztraminer fan, I actually still found this to complement the dish perfectly. I thought the crab and spicy paste a delicious combination. I did encounter a few bits of crab shell though, which is always quite unpleasant. 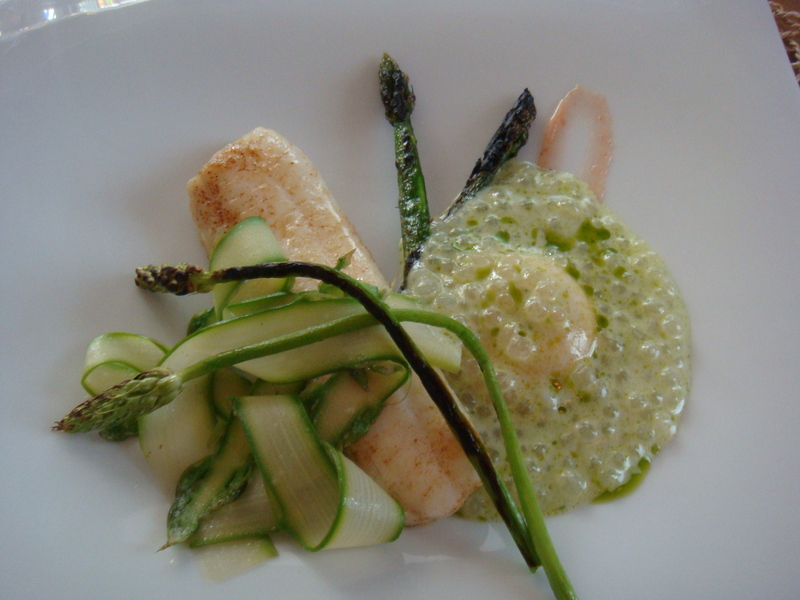 Lemon sole, confit egg, asparagus and tapioca, was paried with Pierre Gimonnet and Fils, Cuis 1st Cru Brut NV. Immediately the egg yolk, ‘cooked for one hr’ caught our attention. It tasted amazing and enriched the herbed soft beads of tapioca which were spooned over it, at the table. The lemon sole was cooked perfectly along with the asparagus but the confit of egg raised the dish to another level of flavour. We didn’t get a full serving of the tasting champagne so the sommelier brought us a tasting of the 1991 Chateau Musar, a wine which we both struggle to come to terms with as a drinkable wine (sorry for all the Chateau Musar fans). Ms L has tried many times but still cannot understand the hype. By this stage I was actually starting to struggle. I think I have a good appetite, so was a bit surprised. The slow cooked (24 hr) Pigs neck with prawn and rye , paired with a Pinot Noir , Burgundy (which I didn’t get the name of), was too much for me by then. I was expecting more from this dish but felt it did not deliver, and was a little bland on the palate. I enjoyed the wine pairing alot more (Burgundy being the wine of the moment for me). So now the journey on the the desserts. 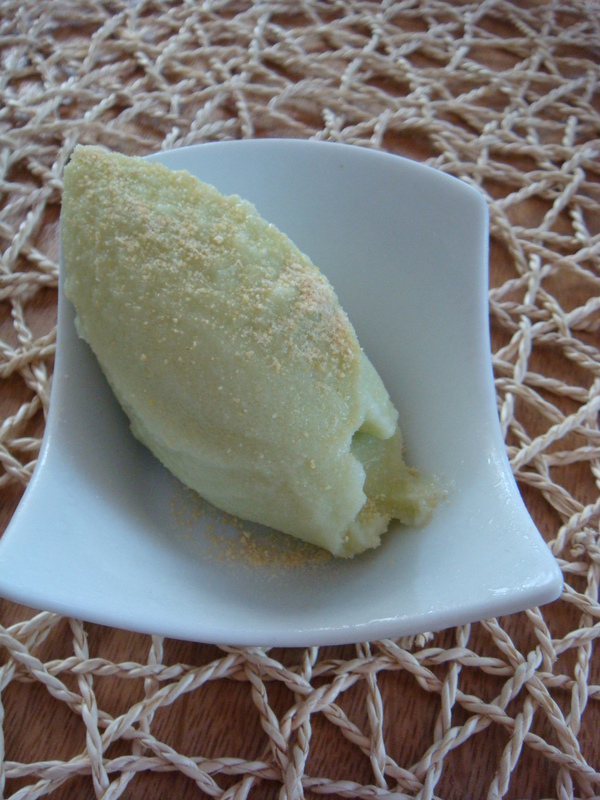 The lime and thai basil sorbet was just divine as I had heard. Refreshing, light and cooling on the palate. 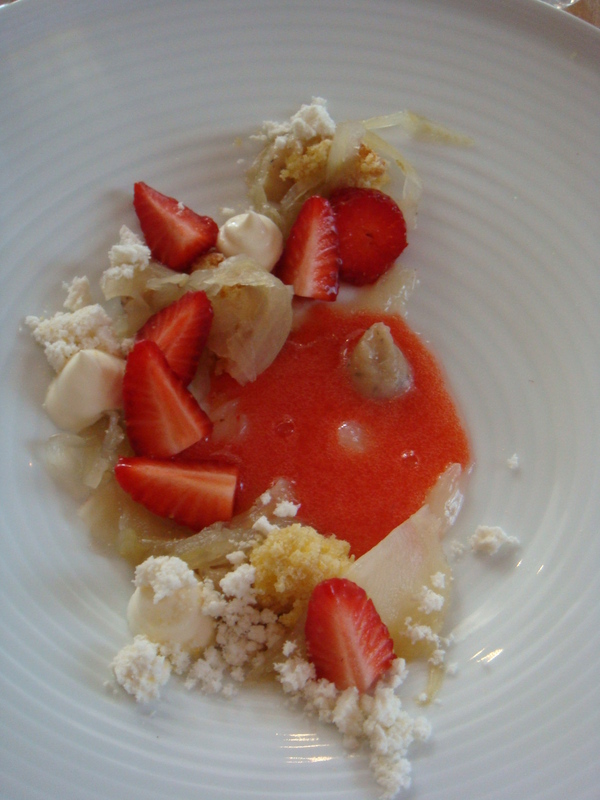 Lemon Polenta, fennel and strawberry dessert. 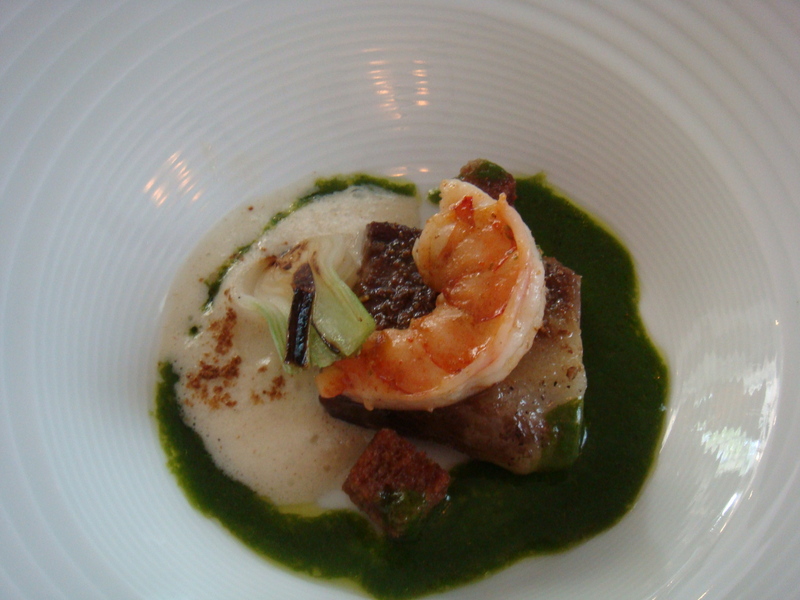 This was pleasant enough dish with beautifully softened fennel, providing interesting flavour to the dish. Ms L found it too sweet for her. By this stage I noticed everyone else had finished and left the restaurant. We were the only ones left, literally! It’s not like we are slow eaters either. The dishes had come out in quick succession and we would have actually preferred to have a longer break between courses. The kitchen was bare, as you can see, with our next course waiting for us. At the beginning of our meal, Ms L had expressed her extreme distain for any chocolate, including cocoa powder, and for it not to be included in any of her dishes. Our final non-chocolate petit fours arrived with cocoa powder sprinkled at the base. It was suggested that she eat the lemon jellies that were not sitting in the chocolate. Luckily Ms L was ok with this and ate the jellies sitting in the ginger crumbs instead. 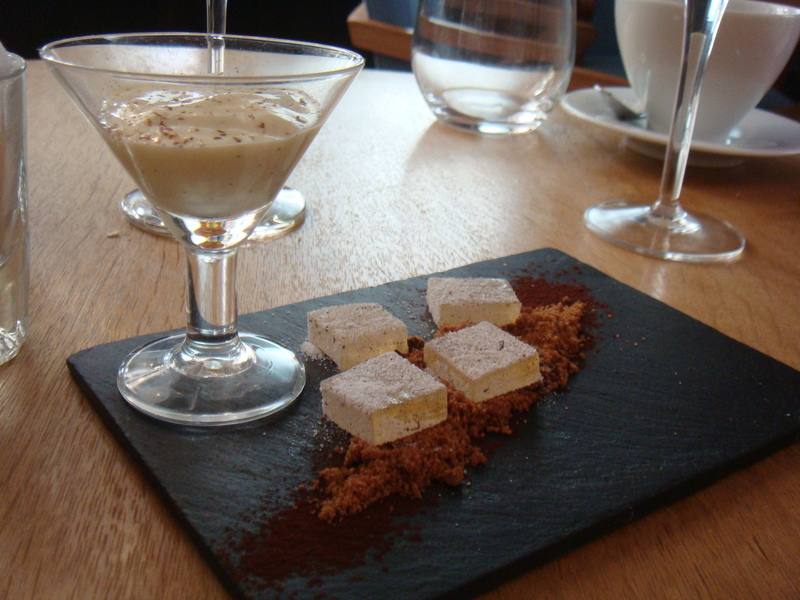 The creme catalana-like accompaniment tasted too much like a plain cake mix to be enjoyed as anything but. As we were the only people left in the restaurant we were able to have a relaxed discussion with the sommelier, who realized he remembered us from The Loft Project with Ben Greeno (something we had hoped he would forget). Viajante is housed in the Grade 11 listed, old Bethnal Green Town Hall. This building has been respectfully restored, transforming it into the boutique Town Hall Hotel, taking over 3 years to complete. So intrigued were we that our lovely sommelier escourted us to the Hotel reception for a guided tour. They have an old court room, which is used as a conference and wedding room, a beautiful indoor pool and state of the art gym which (by september) will have running machines with screen options to run anywhere in the world, including graphics and terrain changes!! 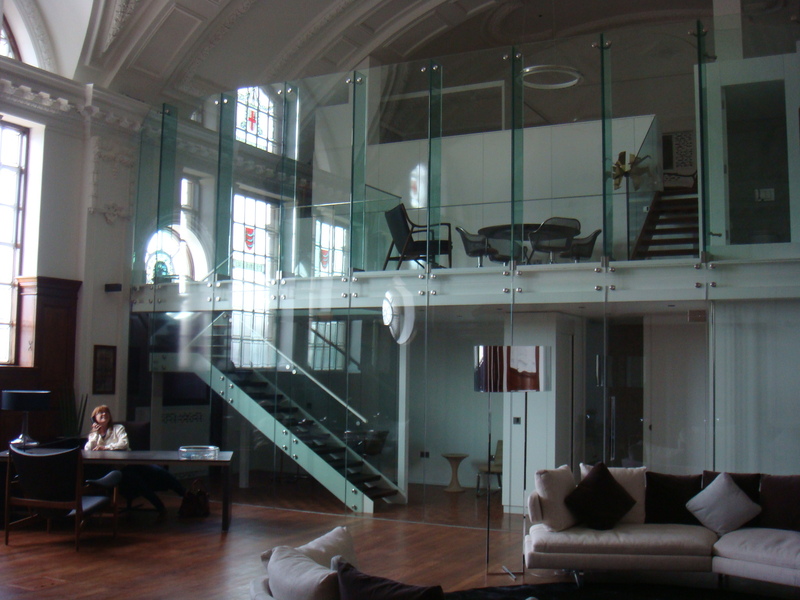 The most interesting room had to be the suite, at £2500 a night. This is where Nuno Mendes will be hosting ‘supper clubs’ again!! The Viajante bar, opposite the restaurant, did not disappoint either. 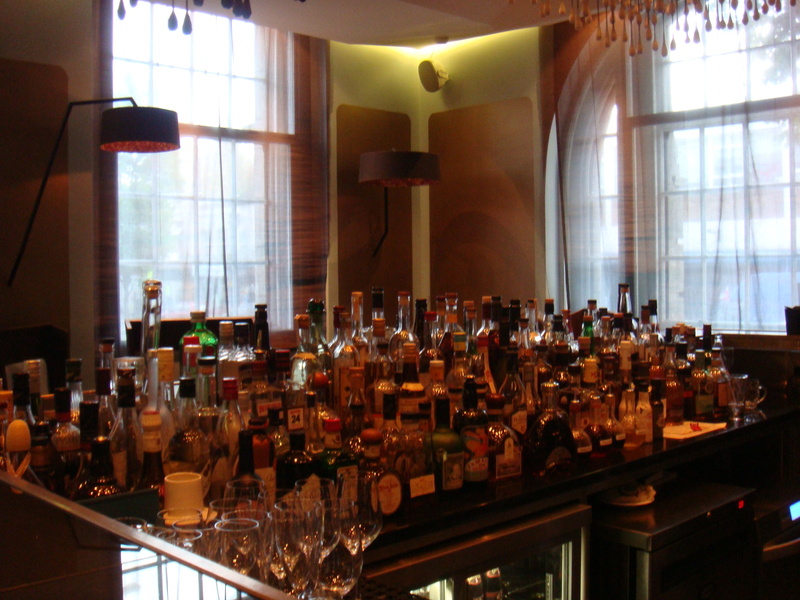 The barmen were young, friendly, and held a passionate enthusiasm for their particular spirit, being rum, sake and tea!! 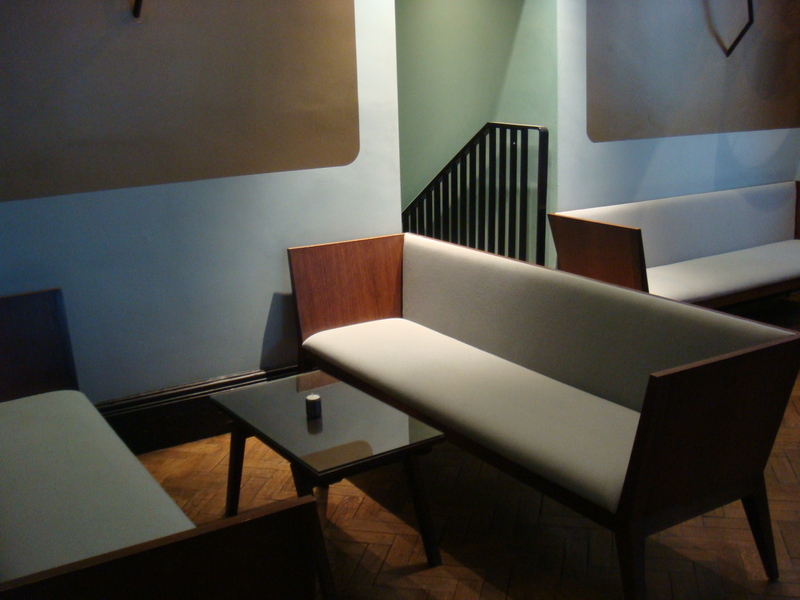 The atmosphere is intimate with 1950’s style scandinavian decor, in keeping with the restaurant. By this time I felt at home and certainly didn’t want to leave. I could have just wandered up the hotels original marble staircase to my cosy, timber floored room, slipped into the big beds and watched a bit of sunday evening TV. But alas I had to leave, jealous this this was not going to be my local comfort zone to escape into. A reason to return and immerse myself in vintage charm and food that excites my eyes, my mind and my mouth. Maybe next time I will be lucky enough to meet the infamous Nuno Mendes.